Burger with sriracha, peanut butter, jelly, and a whole lot of bacon. 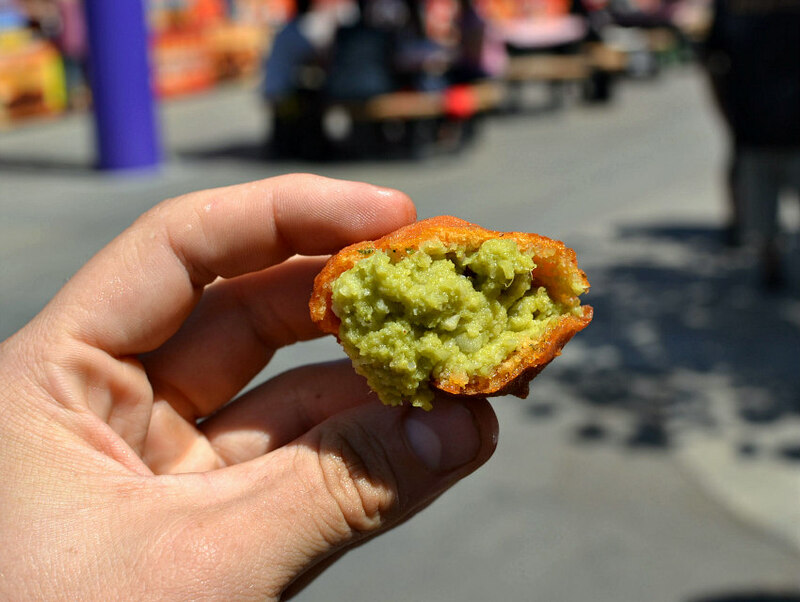 Because where else could deep-fried guacamole be a real thing? 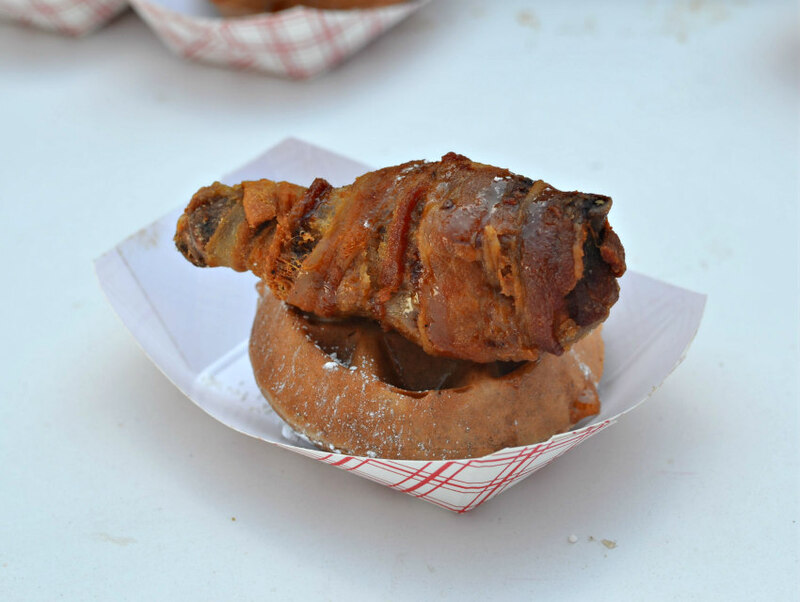 Though FOMO-causing at times, regionality is part of what what makes state fair food so special (in combination with caloric density and slack-triggered whipped cream canisters). As an Angeleno, you have different fried food needs than the rest of the country, and those needs deserve to be met. These are the three dishes that exist nowhere else in the world, except for the L.A. County Fair, which will be at the Pomona Fairplex September 4 to September 27. Leave it to the visionary behind Chicken Charlie’s—the undisputed heavy weight champ of fair food—to take a beloved Mexican condiment and figure out a way to deep fry it. He takes an ice cream scoop to a vat of chunky guacamole, rolls it in breadcrumbs, then in a wet batter, and drops it in hot oil. It’s served with a tiny tub of ranch dressing. Muy autentico! 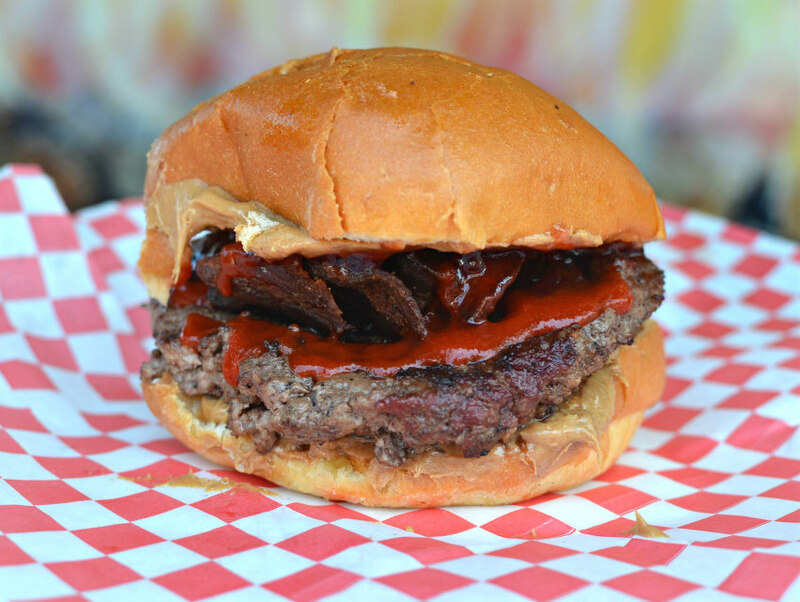 The brainchild of Route 66 BBQ, the spicy PB&J burger starts with a brioche bun slathered with a hefty spread of grape jam, peanut butter, and a more-than-liberal squirt of sriracha. A flame grilled patty is then topped with a handful of bacon and the whole beautiful monstrosity is smashed together. Though this is technically unique to the L.A. County Fair—and sriracha maker Huy Fong’s headquarters are only about 10 miles away from the fairgrounds—it is almost identical to the Grill ‘Em All truck’s Dee Snider burger. Though chicken and waffles were born in the deep south, they made a home for themselves in L.A. through the likes of Roscoe’s and newer, ritzier players like a.o.c., Poppy & Rose, and The Tasting Kitchen. Chicken Charlie did them all one better by wrapping his chicken in bacon before frying it, setting it atop a waffle, and dousing it in maple syrup. Because that’s just smart.